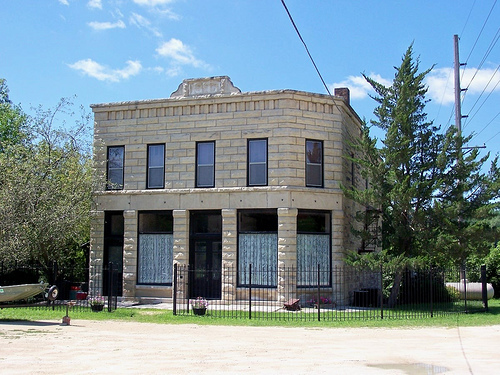 Nestled deep in the heart of the rolling eastern Iowa hills is a historical quarry town called Stone City. Standing with authority in the middle of this community is the Stone City General Store. The General Store, constructed from local limestone, is perched on the banks of the Wapsipinicon River. This old fashion General Store is converted into an inviting and cozy destination restaurant and bar. Complete with a spacious two level deck overlooking the Wapsipinicon River and indoor and outdoor seating. Claim to fame: Building is included in a famous Grant Wood piece. “Stone City Iowa” was Wood’s first major landscape, painted in the same year as his now famous American Gothic in 1930. Located on the Wapsipinicon River twenty-six miles from Cedar Rapids, The land, Wood seems to suggest, has gone back to a purer purpose of grazing animals and growing crops. Wood’s interest in the village continued, and it became the site of a summer artist’s colony which he ran from 1932 to 1933.